Castrol Cyltech CL 100 ACC (Advanced Corrosion Control) is a newly formulated 100BN marine lubricant developed for the latest generation of engines. 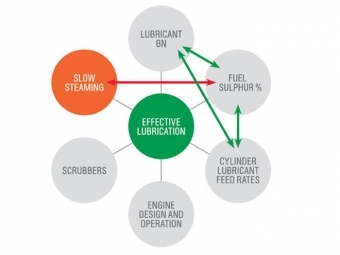 Its introduction to the portfolio follows rigorous testing and trials of new ACC technology that drew on Castrol’s early identification of corrosion in the latest engine types when running on higher sulfur content fuels at part load. Castrol’s confidence that Cyltech 100 ACC is the right oil for the right job is based on significant wear reductions seen with this new technology compared to its previous generation of marine lubricants. Cyltech CL 100 ACC will be made available to customers in major ports from May 2014.